Personalized Backpack Coolers, Custom Printed in Bulk -Promotional Cooler Backpacks. Inexpensive, Budget Prices in USA and Canada. Bulk backpack coolers -cooler backpacks, Personalized or Blank. Our Insulated nylon drawstring backpack features a spacious main compartment. Sturdy 210D Nylon exterior and leak resistant PVC lining. Deep front slash pocket. Sling over one shoulder or wear as a traditional backpack. Cinch closure. 15" W x 16 1/2" Looking for something light and easy to carry all your lunchtime essentials? Look no further, our Drawstring Backpack Cooler is your solution. 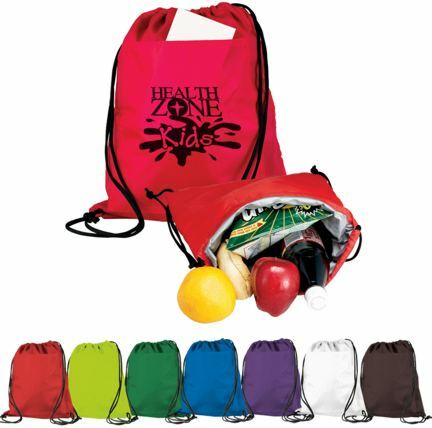 This watertight nylon drawstring cooler backpack is perfect for keep food & drink icy cold while on the go. We also supply blank (not imprinted) cooler backpacks for $2.99 each. Budget Prices in USA and Canada for personalized cooler backpacks. American clients pay no taxes. Prices include your 1-color custom imprint on the front pocket of the backpack cooler. Blank (not personalized) drawstring cooler backpacks cost $3.53 each. Nylon drawstring backpack cooler with insulation! Item Colors: Lime Green, Reflex Blue, Purple, Red, White, Hunter Green, Black (see picture). Other colors may be available: contact us. Rush Lead Time: 1 Business day (contact us). Packaging: Bulk; 100 units per 30 lbs. carton.